If looking at friends of friends’ Facebook photo albums or reading TMI Twitter updates is not enough of a time waster for you, try netdisasters.com. It’s as moronic and pointless as throwing water balloons at passersby, but if you liked that you’ll love this. 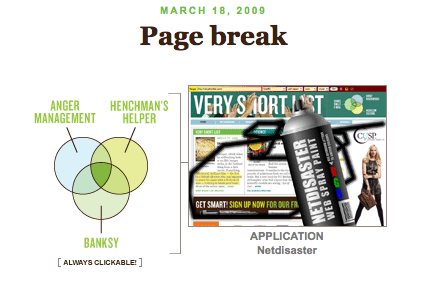 Netdisasters.com lets you destroy – or disasterize! – existing websites for fun. And that’s it, really. It’s harmless, too – you don’t actually destroy anything, it’s only an online game. The editors at Very Short List reccomended this website on March 18th, making it a cross between Anger Management, Henchman’s Helper and Banksy. What? I guess it must be an American thing to associate guns and destruction to anger management, entertainment or Banksy, because I failed to find any relevance, appropriateness or even humor in this website. Call me an European “we don’t need guns to be considered citizens” wuss, but after spending a few minutes on the site and reading the FAQs, I felt the need to sign up for a stricter gun-control petition. Sadly, I didn’t find one. This post was part of a series published on http://maydaypost.wordpress.com for Liz Danzico and Khoi Vihn‘s segment of the Print Meets the Web course.